The recent equity rally has raised the scores of all models across all time frames to bullish. The Ultimate Market Timing Model, the Trend Model, and the Trading Model are all upgraded to bullish. While this is not my base case scenario, there is a decent chance that the stock market may melt-up in light of the Fed’s extraordinarily dovish statement last week. One parallel to the market hiccup of late 2018 would be 1998, when the Fed stepped in to rescue the financial system in the wake of the Russia Crisis. My colleagues and I have one overarching goal: to sustain the economic expansion, with a strong job market and stable prices, for the benefit of the American people. The U.S. economy is in a good place, and we will continue to use our monetary policy tools to help keep it there. The Powell Fed is starting to look like the Greenspan Fed. Instead of taking away the proverbial punch bowl just as the party gets going, the Greenspan Fed saw every risk as an opportunity to ease. 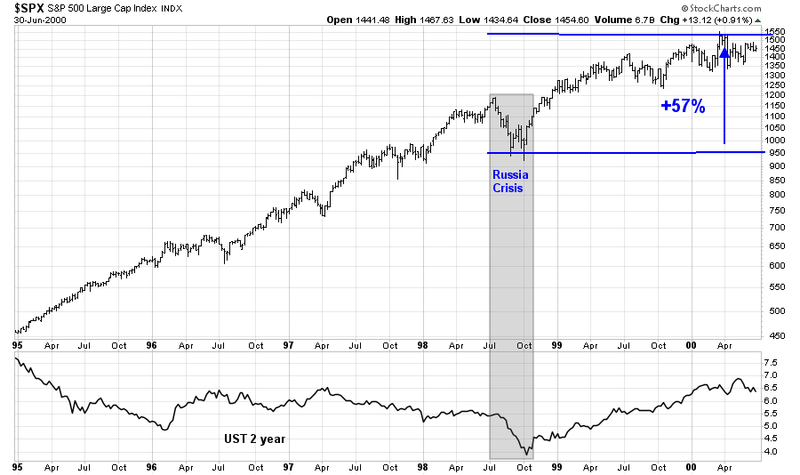 While it did rescue the economy from the Russia Crisis in 1998, it ultimately inflated a stock market bubble that ended with the NASDAQ top in just under two years. Could that be the template for today? The last three recessions were not directly attributable to the Fed action. The Great Financial Crisis (2008) was a financial crisis, the NASDAQ top (2000) was the result of a popped market bubble. and the mild recession of 1990 was sparked by the combination of the S&L crisis and the Iraqi invasion of Kuwait. In addition to an easy monetary policy, the markets can also look forward to an easy fiscal policy, which should be stimulative. The Trump administration has abandoned all Republican fiscal orthodoxy by proposing a budget that will not balance for 15 years. The fiscal deficit will go out as far as the eye can see, even with rosy growth assumptions. He wins a second term. His own OMB projects that he will leave office with a higher debt to GDP ratio than when he assumed office. Are you worried about the deficit, or just the wrong kind of deficit? What if a Democrat wins the White House in 2020? This chart of how American politics has been polarized serves as a useful guide to future policy. If a Democrat were to win control of the White House, policy would take a dramatic lurch leftward. In the current political climate, that means the likely ascendancy of Modern Monetary Theory (MMT) as a policy framework. I have written about MMT before (see Peering into 2020 and beyond and The boom of 2021) so there is no point in repeating myself. There has been much criticism voiced of MMT as an economic theory, but what we are concerned here is not whether MMT is a viable theory, it is whether its framework will be implemented, which would result in greater fiscal stimulus. Central bankers have no popular mandate. They are not elected and are only indirectly accountable to the public. Yet they are granted the “independence” to take unpopular decisions, at least up to a point. Their independence isn’t guaranteed, nor does it always mean the same thing at different points in time. Rather, it is contingent on circumstances. In the years after the financial crisis, the political environment probably constrained the Federal Reserve’s ability to boost the U.S. economy. Things may now be shifting in the other direction. Consider Fed Chairman Jerome Powell’s latest experience testifying before Congress, which occurred this past week. On Tuesday and Wednesday, he took questions from the Senate and the House, respectively. While many of the questions focused on technical issues, such as the implementation of the new Current Expected Credit Loss accounting standard, the optimal level of bank reserves held on deposit at the Fed, and the Fed’s process for vetting proposed bank mergers, several members from both parties pushed Powell and his colleagues to focus on raising wages and altering the economic split between workers and investors. Political priorities change. The Fed sails in a sea of political winds that cannot be ignored. Analyzing theories like MMT to determine whether they represent good policy is futile for investors. Even if it turns out to be bad policy, the consequences won’t be felt for years, and investors should instead focus on the likelihood of its implementation, and its fiscal effects. My pet theme: inflation is everywhere and always a political phenomenon in the current context of clash of generations, between Millennials and Boomers. In a way reflected in AOC vs Schultz. The Boomers are entering retirement and sitting on assets that are richly valued. Inflation is poison in more ways than one. In fact, rising wages are poison because it cuts into their living standards. They want sell down their big houses and downshift. The same thing happened in Japan but was decisively won by the retirees because they were preoponderant. In contrast, the Millennials are more or less the same size as the Boomers. So, the clash won’t be so decisively settled. Ironically, Boomers when they were in the same position as Millennials today, i.e in the 1970s, won the battle decisively because they were dominant demographically. That is one reason why we had inflation. The point being economic theories don’t have as much influence as people think. People use them to rationalize whatever policies favors them. 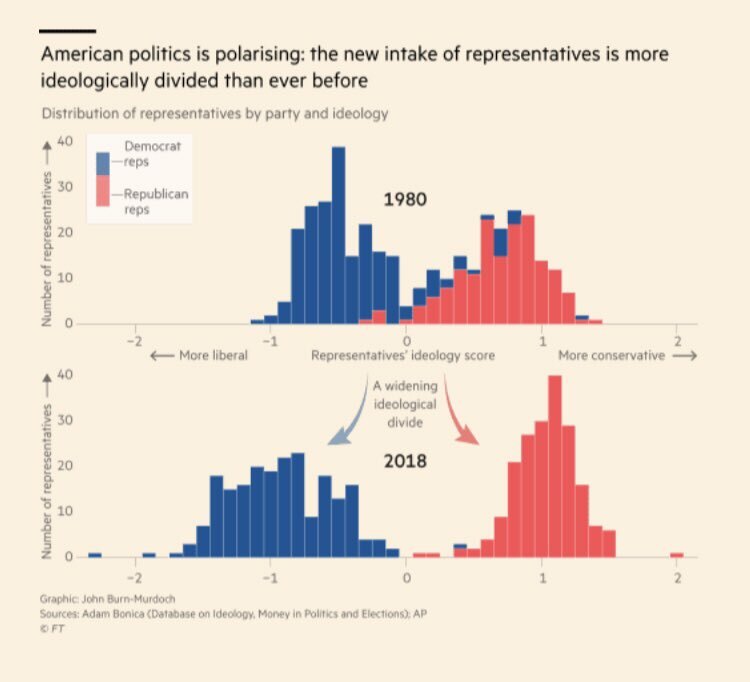 Part of the reason for MMT gaining strength is it appeals to a constituency and the increasing divergence of interests. As Millennials grow older and participate in the political process, their influence will grow. Over time, they will flex their political muscles, and the implementation of MMT will deliver the inflation that will favor their generation at the expense of the older Boomers. Whether that happens in 2020, or in the years beyond, is an open question. The midterm election of 2018 saw more Millennials participate in the political process, and expect that generation’s political power to grow as time goes on. The sweeping liberal ideas backed by many of the party’s candidates — Medicare for all, a “Green New Deal,” and a $15 federal minimum wage — would struggle to get past a Senate where Republicans are likely to retain powerful influence over what legislation becomes law, even if a Democrat defeats President Donald Trump and takes office in January 2021. Some Democrats are sounding warnings about the expectations being raised among the progressive voting base that helped the party gain control of the House and who’ll be crucial to any chances of winning the White House. The Senate is going to make or break the progressive agenda in 2021, regardless of how well we do at the top of the ticket,” said Adam Jentleson, a former spokesman for Senator Harry Reid of Nevada. The problem is math and congressional procedure. In the best case scenario for Democrats — another wave election that consolidates the party’s hold on the House and wins them a majority in the Senate — any far-reaching changes still would struggle to get 50 votes in the Senate, let alone the 60 votes needed to advance most legislation. Imagine that you are the finance minister of a small, developing country that has just discovered an ore belt rich in cobalt, a metal that has more than doubled in price over the last five years. You, a capable technocrat, are familiar with Dutch disease. You know that the sudden discovery of reserves of a high-value commodity can cause sclerosis in other industries, particularly manufacturing, as happened in The Netherlands after the discovery of natural gas in the late 1950s. Now: imagine you are the Secretary of the Treasury of the United States of America. For “cobalt-rich ore,” substitute “dollars,” or “dollar-denominated assets,” or perhaps just “Treasuries.” You still need to worry about Dutch disease. We just never talk about it that way, because the whole framework of booming-commodity-sector analysis is a condescension we reserve for developing countries. The dollar is universally a store of value, a medium of exchange and a unit of account — all the things we consider “money.” It is arguably the only currency that is all three of these things. The United States Treasury is not the only place to get dollars. The United States isn’t even the only place to get dollars — foreign institutions create dollar-denominated assets, for example — but it is the best place to get dollars. So let’s go back to the original research on Dutch disease. We have a basic model of an economy where the export of a single commodity raises the exchange rate, discouraging the export of manufactured goods. If the commodity is the dollar, then demand for the dollar raises the value of the dollar itself — this isn’t too hard to wrap our heads around, and since 1980 the dollar has appreciated, even as the US has declined as a share of global GDP. We’d expect to see inflation in nontradable services, like medical care and college tuition, but not in tradable goods, like t-shirts and TV sets. And we’d expect a decline in the value added to GDP from manufacturing. None of these are dispositive, and Alphaville is sadly not an econometrician. But they have all happened. Bottom line: If MMT is framed as a clash between generations, then its influence is likely to grow over the next decade. Moreover, the position of the USD as a major global reserve currency also facilitates the implementation of MMT, as debt capacity is likely higher than predicted by standard economic models. I have been calling for a brief market correction over the next 2-3 months because of short-term economic weakness. So far, stock prices have not reacted to the fears of a slowdown. While a correction may still occur, its likelihood is diminishing because I am seeing green shoots of growth. 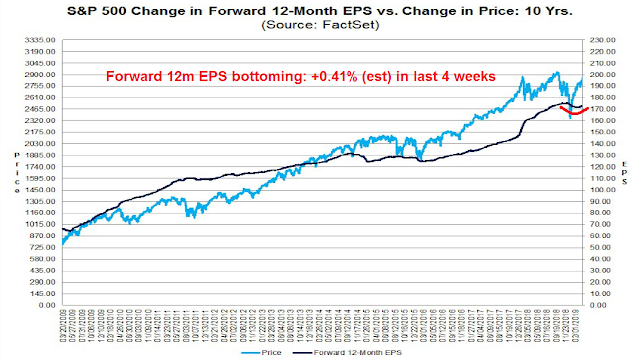 In the US, the latest update from FactSet shows that forward 12-month EPS are bottoming. Forward EPS estimates were declining for most of 2019, but they bottomed and began turning up in the last few weeks, which is a sign of improving expectations. Over in Asia, the risks to China is highlighted by the evolution of the biggest tail-risk in the BAML Fund Manager Survey, which is the risk of a China slowdown. China will not let economic growth slip out of a reasonable range despite the additional downward pressure, said Premier Li Keqiang on Friday at a news conference at the conclusion of the annual parliament meeting. China lowered the economic growth target this year and set it as a range, which is actually a signal of stabilisation for the market, said Li. China is target a GDP growth range of 6 – 6.5 per cent this year. Li said China can resort to quantity-based or price-based policy tools such as banks’ reserve requirement and interest rate tools to to boost the economy, which bolstering higher expectations for more stimulus policies. 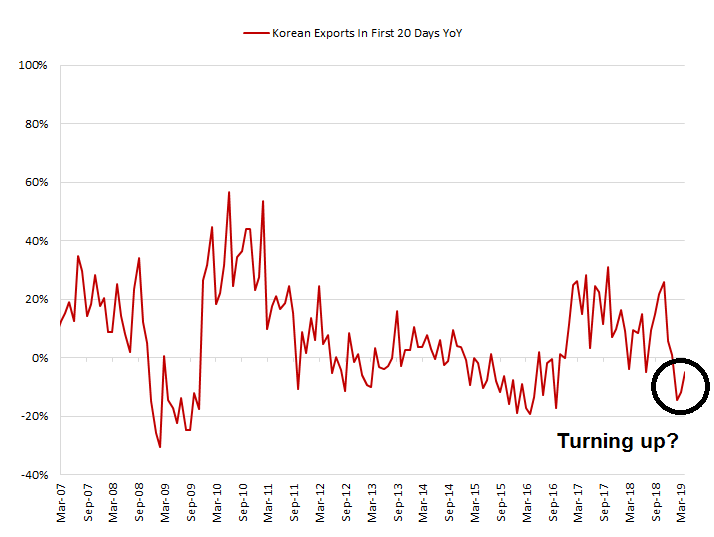 One timely data point is South Korean exports, which is a sensitive barometer of global and Chinese growth because much of South Korea’s trade is with China. The March 1-20 year-over-year export statistics are improving. Exports were -4.9% v -11.1% in Feb. Exports to China was -12.6% v -17.4% in Feb. In Europe, top-down economic indicators are also improving. The Citigroup Europe Economic Surprise Index, which measures whether economic releases are beating or missing expectations, has bottomed and started to rise again. 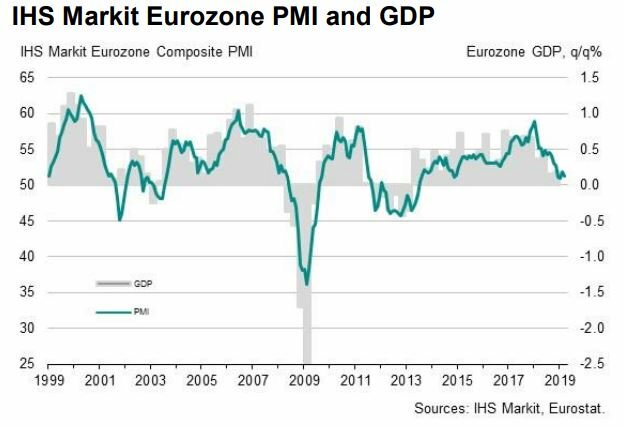 The slowdown in eurozone manufacturing may be reaching its nadir. China Beige Book found that Chinese headline growth is highly correlated to German IFO with a one-month lead. The nascent turnaround in Asia is good news for eurozone manufacturing exports. There is an additional technical perspective to the melt-up bull case. Regular readers will recognize this monthly price chart of the Wilshire 5000, which was prescient at spotting a negative RSI divergence last August and flashed a sell signal (see Market top ahead? My inner investor turns cautious). The vertical lines represent buy (blue) and sell (red) signals based on zero line crossovers by the monthly MACD histogram. 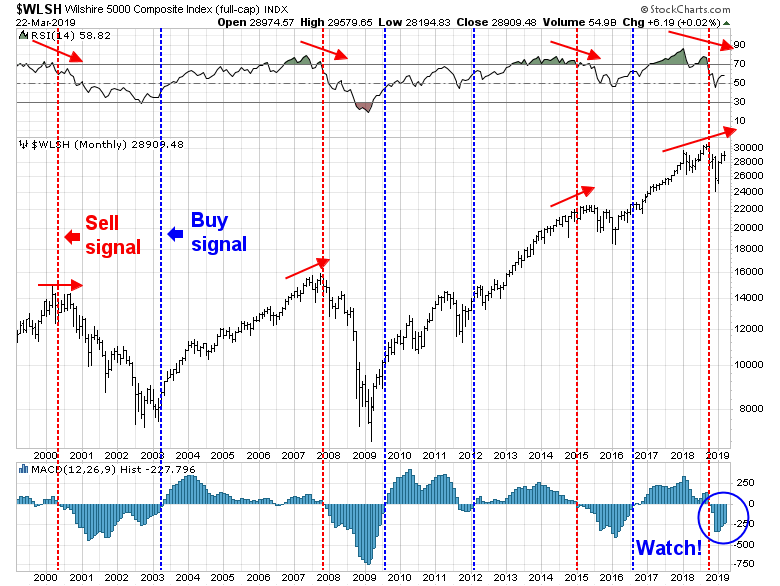 While I am not in the habit of anticipating model signals, the market is 3-4 months from a buy signal at the current pace. 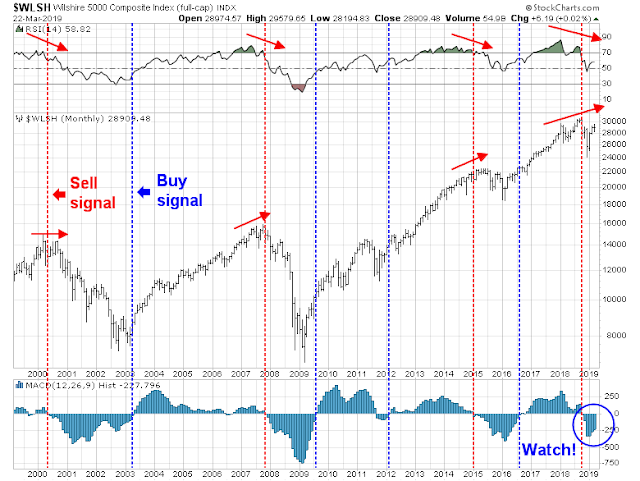 Past buy signals has been a highly effective at spotting long dated profitable uptrends. In addition to US stocks, the technical condition of stock markets around the world have improved sufficiently that all trend model scores have been upgraded. None of these formations appear bearish. At worse, they can be characterized as “constructive”, which calls for accumulation instead of an outright buy signal. Here is Europe. 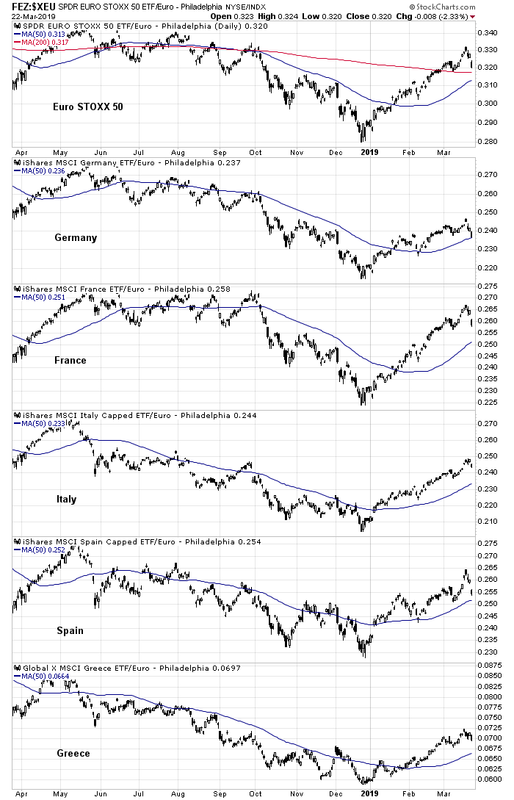 The weakest markets seem to be the core European countries of Germany and France. Peripheral Europe is behaving even better than core Europe. UK equities are also performing well, despite Brexit anxieties. 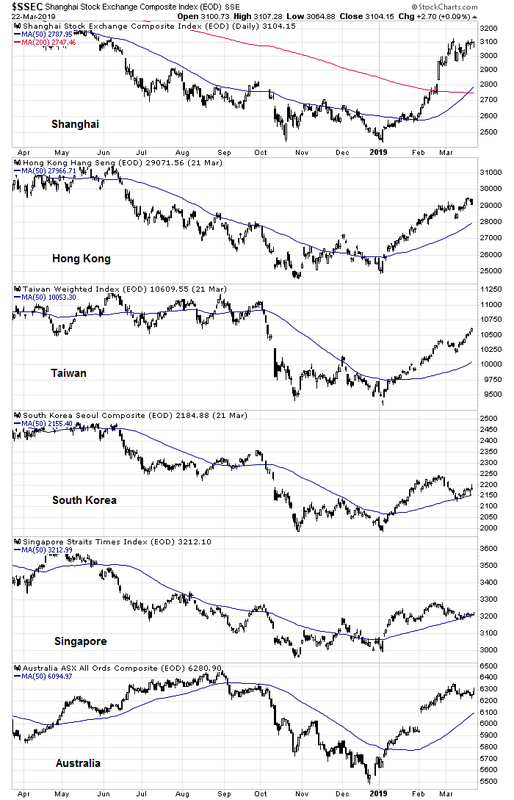 The markets of China and her major Asian trading partners have also recovered. Lastly, commodity prices, as measured by industrial metals, and the CRB Index, are in the early parts of uptrends. What about the yield curve? Some market anxiety has arisen recently because of the behavior of the yield curve. In particular, the belly of the curve has inverted. The spread between the 10-year and 3-month T-Bill is now negative, and the 2s10s spread has fallen to 11bp, which was the level last seen at the height of the December market sell-off. Should you be worried? A flattening or inverted yield curve is a bond market signal of slowing economic growth. As the theory goes, as the Fed raises rates, the long end of the yield curve falls to reflect lower growth expectations. An inverted curve has been an uncanny signal of impending recession in the past. This time really is different. The Fed has given a dovish signal, and the belly of the curve has fallen faster than the front end. 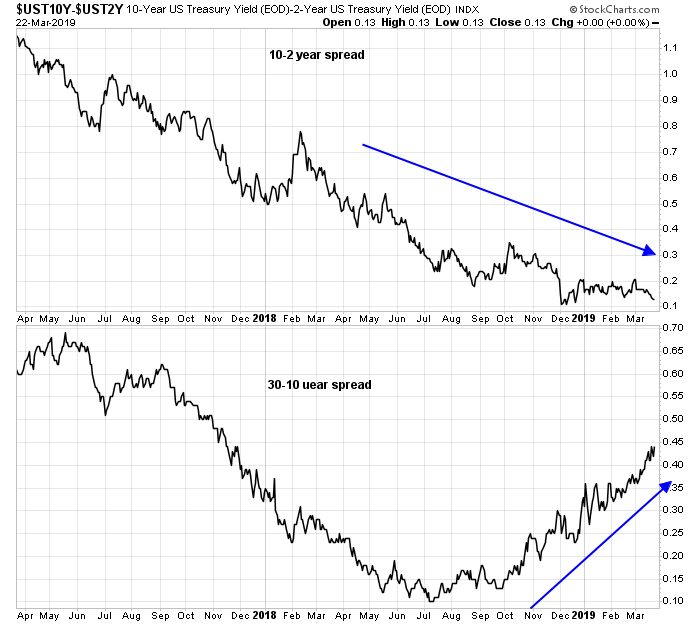 Moreover, while the 2s10s spread has been flattening, the 10s30s has steepened in the last few months. Which yield spread should you focus on? The short end and the belly of the curve, which is most affected by Fed policy, or the long end, which is mostly determined by the market? 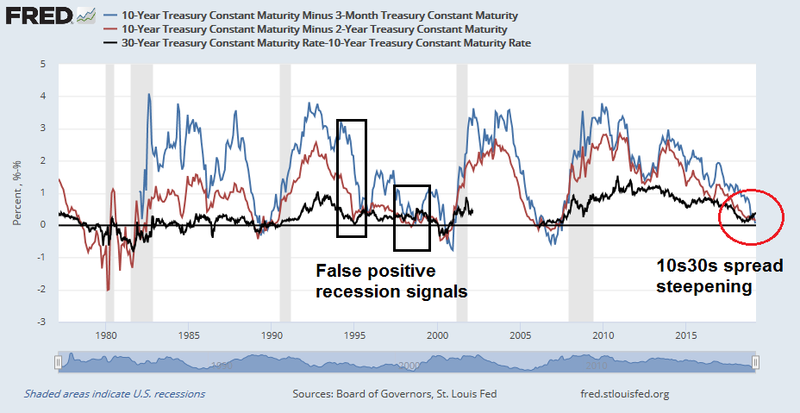 The answer is both, but I am skeptical of a recession signal from a flattening or inverted yield spread that is unconfirmed by the other, especially when the Fed is dovish. I was far more concerned about recession risk last year when the 2s10s and 10s30s were flattening in lockstep. 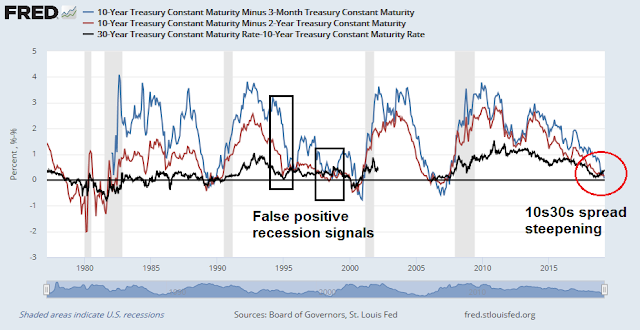 The following chart of yield curve recessionary signals indicate that false positives occurred twice in the 1990`s when inversions or near inversions in the short end were not confirmed by the long end. The first was in late 1994, when the Fed adopted a dovish tilt after a series of rate hike, and in 1998, when the Fed stepped in to rescue the financial system in the wake of the Russia and LTCM Crisis. 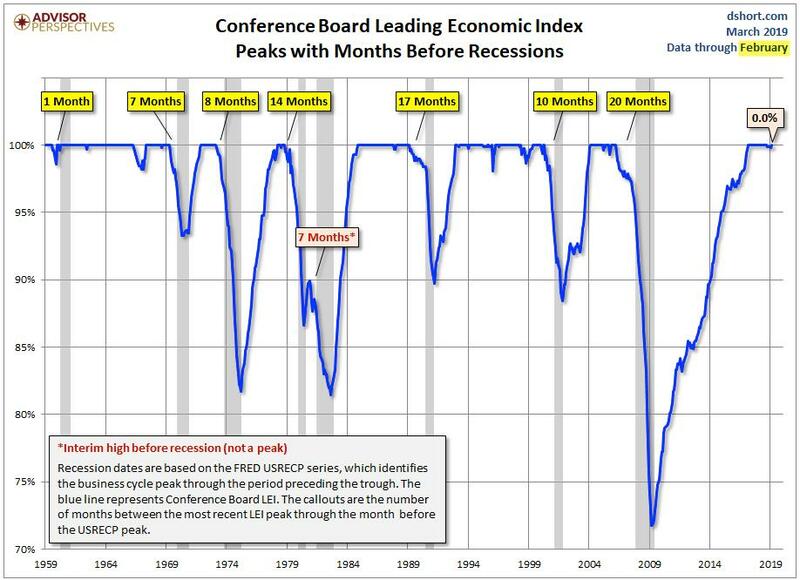 It is also difficult to believe that a recession is imminent when the Conference Board Leading Economic Index is so strong and shows no signs of deterioration. In conclusion, the combination of accommodative fiscal and monetary conditions may be setting stock prices for a market melt-up into 2020 of unknown magnitude. The market has shrugged off slowing growth fears, and early signs of a pickup are beginning to appear. While a correction may still happen, I would regard any weakness as an opportunity to buy. 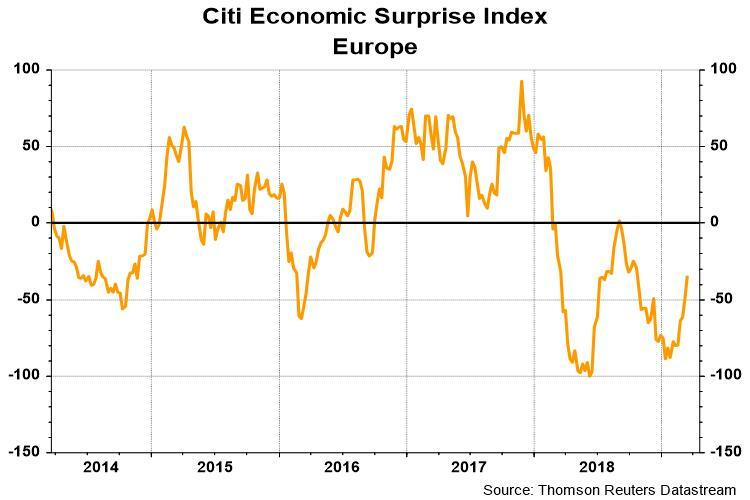 Looking to the week ahead, it is instructive to see how sentiment has shifted in a single day after soft flash PMI data from Europe, and the inverted yield 3m10y yield curve. 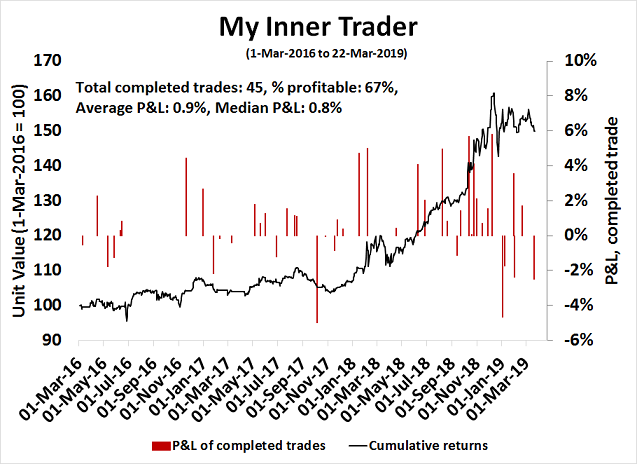 Subscribers received an alert that my inner trader had taken an initial long position in the market, and the pushback was considerable. 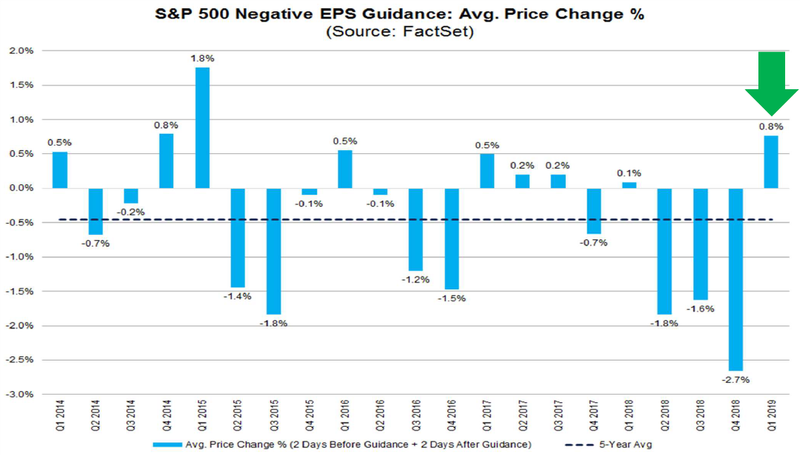 FactSet reported that the market has not been reacting to negative earnings guidance, which may be a sign that a slowdown is already priced in. 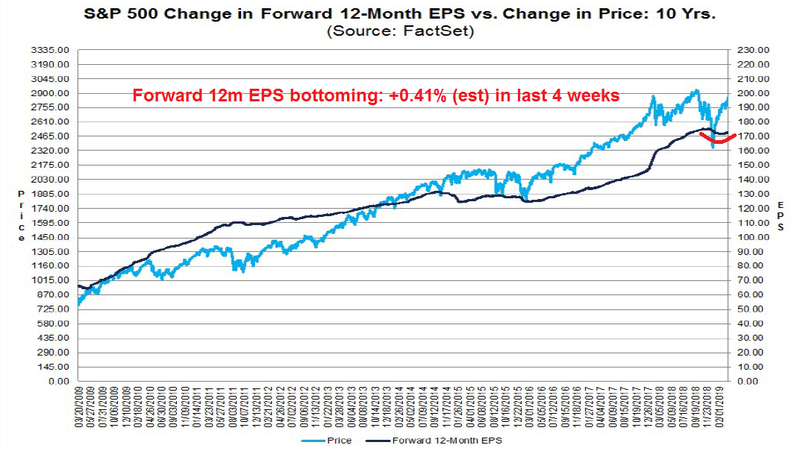 This interpretation should be given greater consideration as forward EPS estimates are now bottoming out. 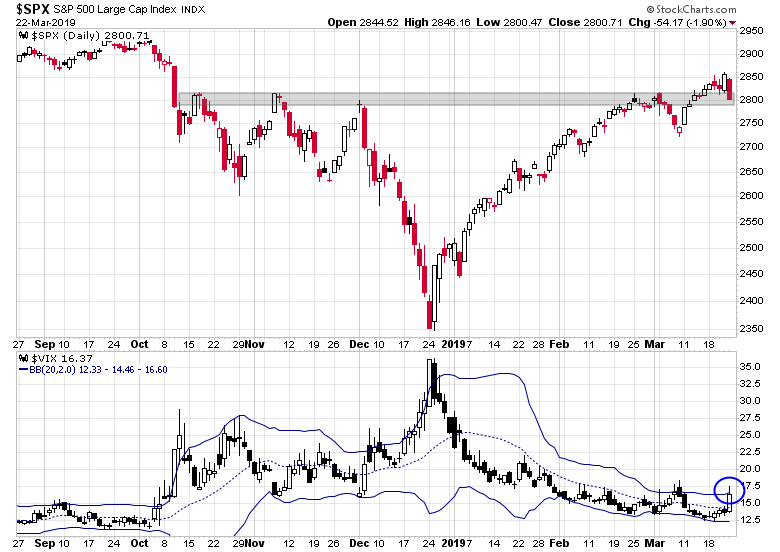 From a technical perspective, the S&P 500 pulled back to test a resistance level turned support, as the VIX Index neared its upper Bollinger Band, which is a sign of an oversold market. The VIX Index spent much of Friday above its upper BB, which is one mark of an oversold market, but pulled back below the key level just at the close. Here is the 5-minute chart. After the market closed, the news that Robert Mueller submitted his report hit the tape, which may serve to spike volatility next week. On the other hand, the news that Mueller has recommended no further indictments. such as Donald Trump Jr. or Jared Kushner, may be interpreted positively and spark a risk-on rally. 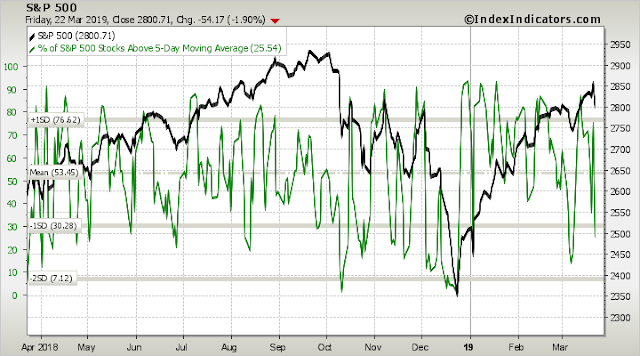 Short-term breadth deteriorated to mildly oversold condition as of Friday’s close. 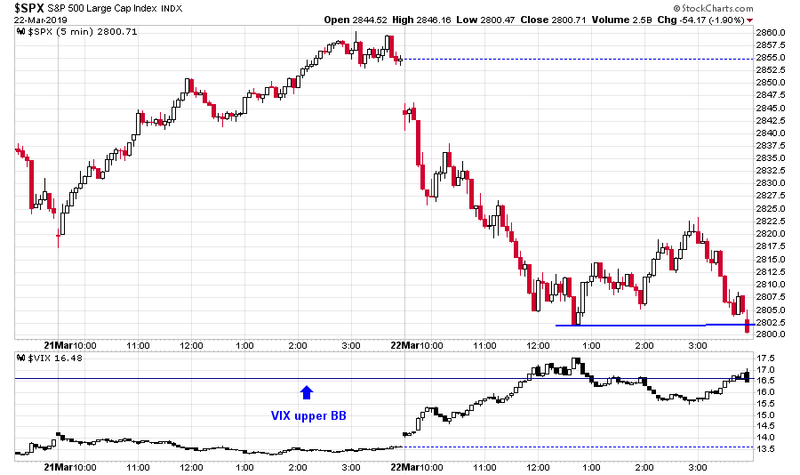 While the market can go lower, the 1-2 day risk/reward is tilted bullishly. Can the resistance turned support level of ~2800 hold? Are mid and small caps, which have been underperforming, hold their relative support lines? 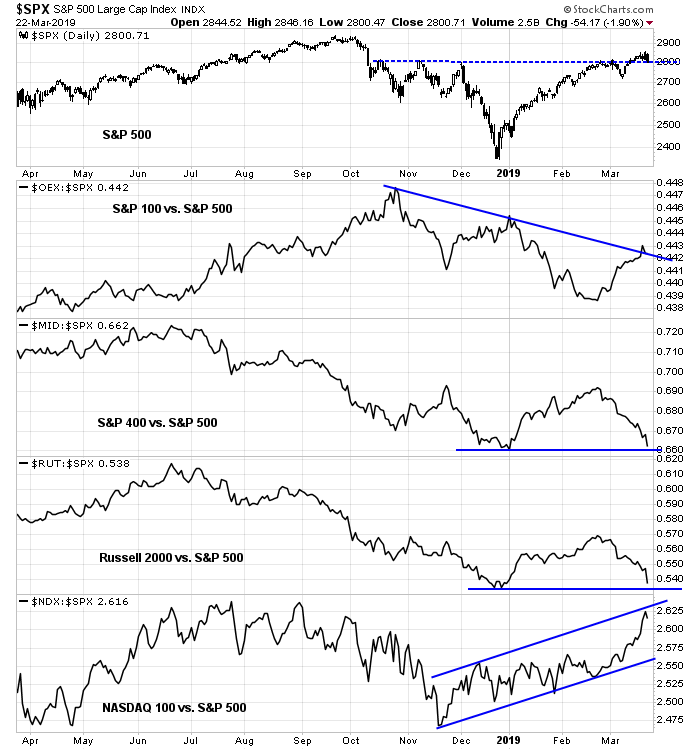 NASDAQ stocks, which have been on a tear and appear a little extended, continue their market leadership status? Do the bulls still have control of the tape? 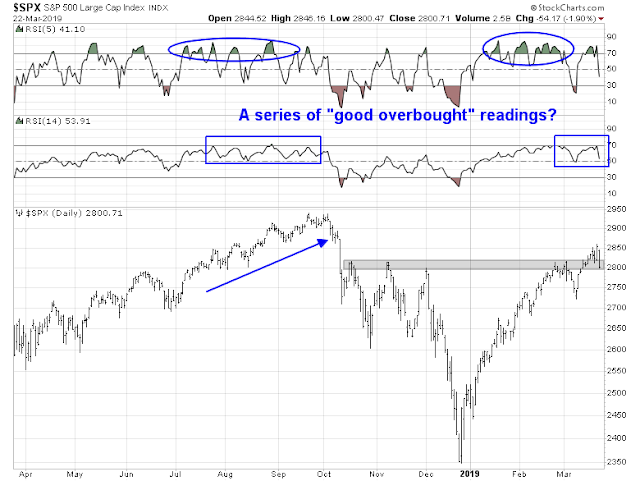 Is the market rallying on a series of “good overbought” readings on RSI-5, only to see any pullbacks halt with RSI-14 at about the neutral 50 line? If the bulls were to maintain control of the tape, I would like to see better performance by equity market risk appetite factors. 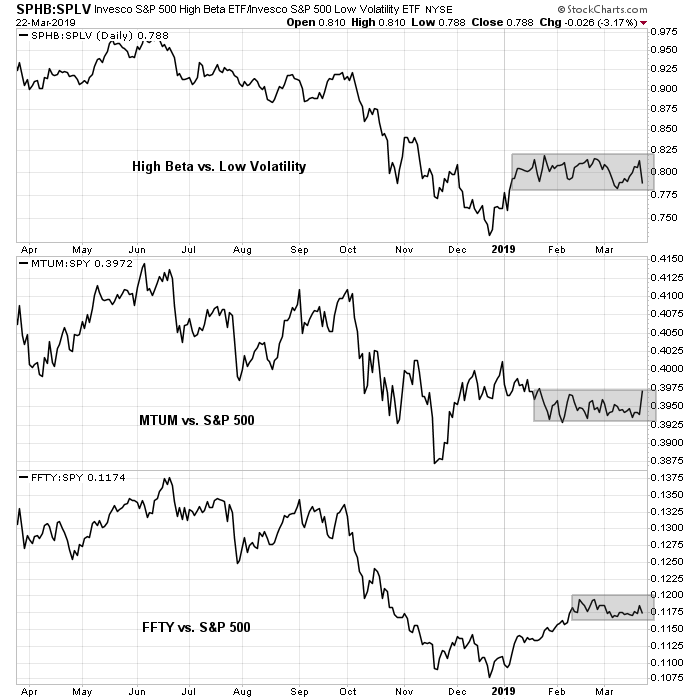 So far, the relative performance of high beta vs. low volatility, pure price momentum (MTUM), blended momentum (FFTY) are all range bound. Can they break out of their ranges? In which direction? Credit market risk appetite indicators have not given many clues. 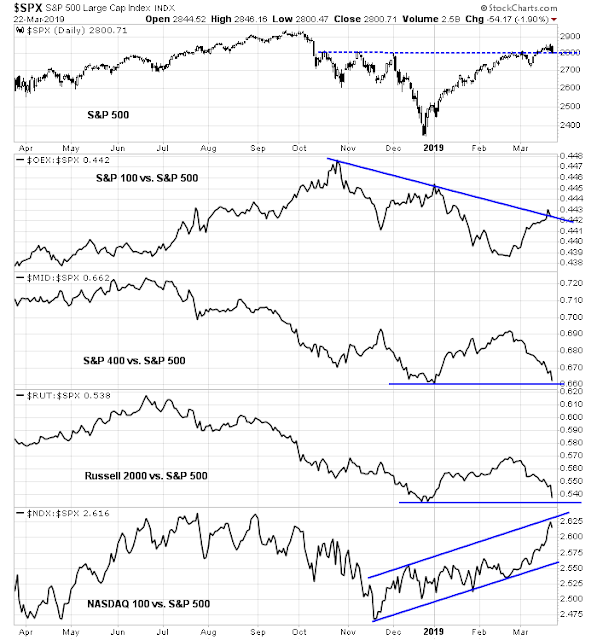 The duration adjusted price relative performance of high yield (junk bonds), investment grade, and EM bonds are all tracking the stock market. There are no significant divergences. 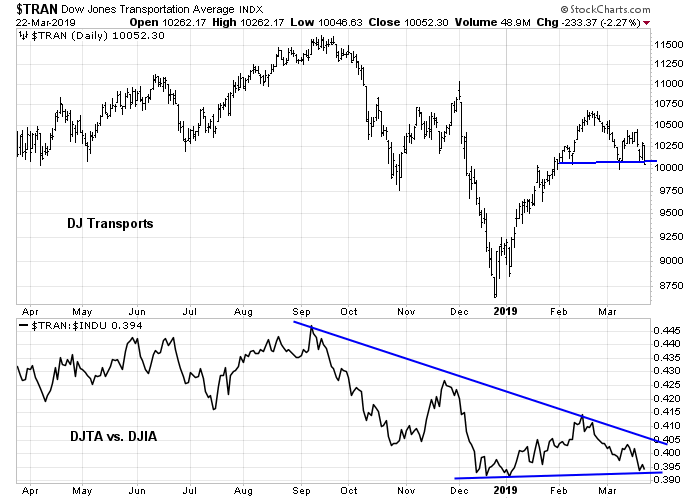 Finally, much has been made of the poor recent performance of the DJ Transports by some technical analysts. 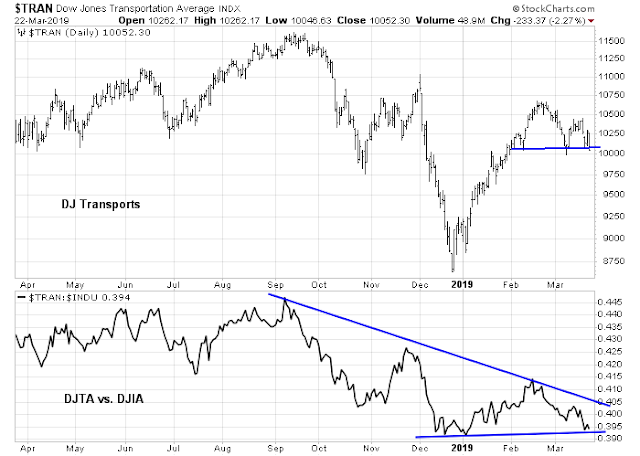 Can the Transports hold their absolute and relative support levels? That will also provide another clue to future market direction. My inner investor was neutrally positioned at his target asset allocation weights. He allowed his equity weight to drift slightly upward as the market rallied and he is not trimming those positions back. His view is to remain cautious by avoiding being the FOMO buyer, but to buy any dip that occurs. My inner trader is giving the bull case the benefit of the doubt. He covered all of his short positions on Wednesday in the wake of the dovish FOMC statement. He has taken a small initial long position in the market. On Twitter many are arriving at a different conclusion, ie this rally being the first leg of a bear market, implying the November fall and the January strong recover as an EW a,b,c, correction. It’s very hard to forecast out that far without knowing the actual nominee. We also need to know how each side is polling, because the Ds won’t be able to implement their program without controlling Congress. Everything works until it doesn’t. Which way the market will go depends on where the money goes. Sometimes the market does top out with a melt up, so this could happen. MMT to me is a wealth tax, but one which is taxing all assets via the dollar. So you get inflation, but one day you sell your asset and you pay the tax. The critical feature of MMT is to print in your own currency. Why some countries have taken on foreign debt is interesting, but sets this spiraling trap on the currency front. Should the US embrace MMT then one would think this will hasten the demise of the USD as world reserve currency because why would other countries want our currency when we print it at will. The problem with the fed and data is that by the time they have the data, it is too late, like having a fire detector that detects flames. So of course they see everything is good until it is too late. One of the TA measures that seems to be fairly reliable is support/resistance lines. Right now we have 2 possibles, bull and bear. The bear is that the rally since December is pulling back to the old support around 2800, yes it has gone higher than I would expect, but if things crash that’s how it will be seen. The bull is that the rally broke through resist at 2800 and just made a pullback to that level and will go higher, much higher….that could be the melt up. Or of course things could go sideways. My bias is that even though prices are high, we are not done yet and we shall see newer highs, but I am very nervous and fear that when it goes down it could be very fast, like 1929 or the nasdaq popping in 2000. For a major central bank, there are only two major currencies in the world that qualify for reserve currency status because there is enough of it sloshing around the global financial system: the USD and EUR. Do you really want to hold EUR in your reserves in light of the structural problems of the Eurozone? 3) Not enough gold around to form a major part of FX reserves. Consider that the US Treasury gold holdings dwarf the gold holdings other than the IMF compared to other central banks. If the US were to sell all of its gold today at market prices (and they hold all the gold that they say they have), they would get a little over 300 billion. That is not enough to even cover a single year’s budget deficit. 4) There are not enough CNY around. In order for China’s currency to become the candidate for a major FX reserve candidate, it has to run current account deficits in order to crate CNY supply. I think the problems are those faced by empires over the last few thousand years, debasing the currency because they could and it seemed the best choice at the time. Agreed that right now the euro looks risky so the USD is the least ugly at the dance, but history says this never goes on forever. If the US embarks on MMT this would encourage other countries to find some other means of accounting. There is a reason sand is not a currency, even though it is very useful when making concrete, and we know concrete is also very useful. They will come up with something else, what this would be I don’t think anyone knows, but if they are logical it would be based on commodities, useful things. Gold is not that useful on a day to day basis. It is rare, but what happens if some geek finds a way to get the 2 or 3 cubic miles of gold out of seawater? Diversification for a basket of useful things would make disruptive events have less impact on the currency. Most likely this will not be for a long time and then it will be sudden. Like Hemingway, the Berlin Wall, glaciers calving. Sloshing around notwithstanding, all commercial contracts are subject to the laws and courts of the country who issues the currency in which the contract is written. Until another country’s court system is established and working for several generations, there will be no other choice than the US as a reserve currency. It would be nice if the reserve currency is stable, but it will always be the country’s legal system that is paramount. https://oregoneconomicanalysis.com/2018/05/18/fun-friday-do-people-really-downsize/ ). Many (42%) say they want to but like the 6 friends of mine in their late 60s, they are not doing it. In fact there is less movement/selling by that age group than at any time since 1980. Also, they and I, a boomer house owner, would love to see inflation. 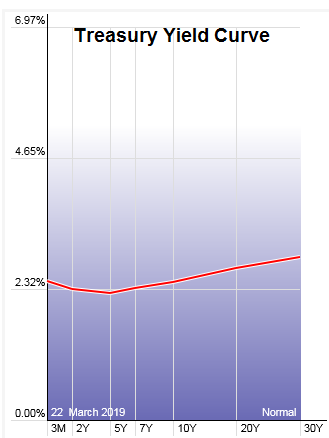 Most money I ever made was when I owned two houses in Arlington Va when prices were going up 20% a year. So spend baby spend, I guess. Cam, interesting read and I think a compelling argument for change of view. I can tell you that with retail clients, I haven’t seen them this bearish other than in 2000 and 2008 pullbacks, and thats contrary bullish as well of course. Your breadth thrust call was great. The 2018 bear market was a Beta crash. These happen without a recession. They happen when investor sentiment gets too optimistic pushing stock markets too high. Will we have another leg down is the big question. In 2015 – 2016 we had two down-legs of the High Beta Index. They were preceded by non-confirmations between the High Beta Index and Low Volatility Index. Here is the chart of that. The October 2018 to December market low High Beta crash was also preceded by a non-confirmation between the two indexes. Here is that chart. 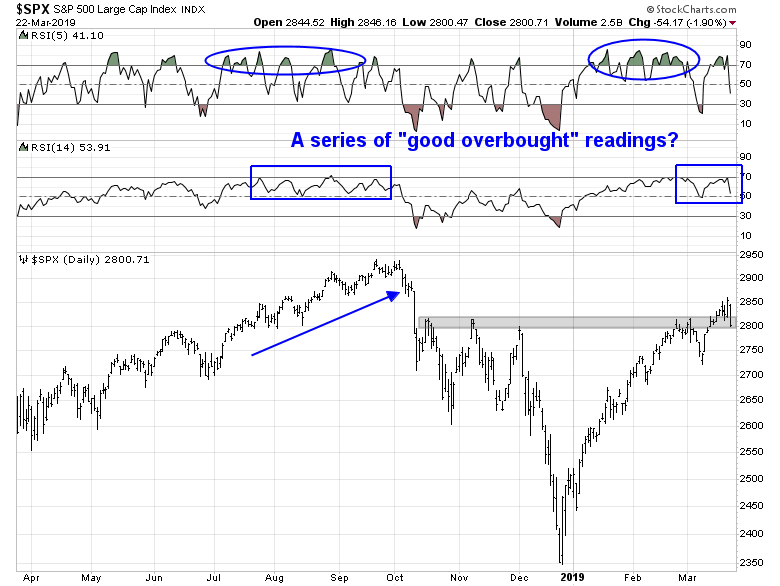 In the last few days, there has been a big non-confirmation (circle on chart) that may signal a new down-leg. I’ve purchased on Friday an alternative ETF that is Anti-Beta that will go up if High Beta falls. I had expected the 2018 Beta Crash to wash out the speculative juices and set us off to a more normal bull market. But it seems that High Beta is coming back with the new Powell Put. 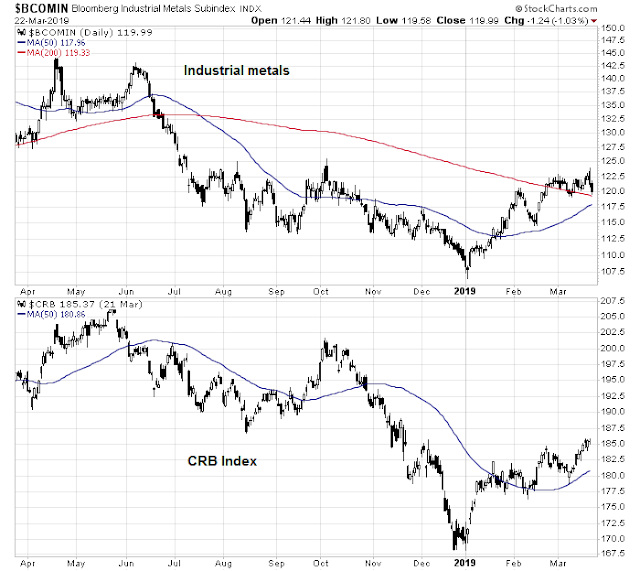 All my momentum work on how industrial sectors and factors styles shows they are not acting like a new bull market but rather as a continuation of the Feb. 11, 2016 to 2018 bull. If that is true and High Beta has a minor pull-back before heading higher, we might see the a melt-up with historic bubbly investor sentiment down the road. If the economy stumbles a bit in the next few months and recovers at the same time stock markets keep going up, that will embolden investors even further. They will believe the U.S. government (Trump or any other President) plus the Fed will backstop any economic weakness so that nothing will stop this bull market soaring higher. They will think they are bulletproof. Watch for a spike higher in margin loan data. This scenario is a non-normal outcome. What is normal is the High Beta should correct here. If it doesn’t, buckle up your seat-belt and expect a silly, frothy peak around the first quarter of 2021. It will be a thrilling ride and the aftermath will be ……. Hell, let’s not worry about that for now. Hi Cam, in general should I focus on sentiment surveys on the big boys (e.g. NAAIM Institutional survey) or surveys focusing on the retails and/or traders? I haven’t done my homework yet and not sure which survey is which but from my quick readings some survey says sentiment is progressively bullish but not so bullish yet (I think it’s the institutional survey), some other survey says it’s overly bullish but starting to turn down, while another indicating very bearish sentiment. This is a bit confusing. Cam: Can you provide the Buy & Sell dates for the Ultimate & Trend Trading Models? Thx. The signal of the Ultimate Market Timing Model is designed to be an extremely slow moving in order to facilitate asset allocation for long-term investors. It had been on a buy signal since I started writing about it in January 2016. It went to a sell on December 2, 2019, and returned to a buy signal March 24, 2019.